>Flagstone is the most commonly used stone in patio-stone-design work. The odd shaped pieces are placed in a bed of compact sand and usually fit together like a puzzle for a tight pattern. Sometimes grout is used between the stones , but my opinion is that makes it look horrible. We just use chat or rock dirt between the gaps. Ask your local rock supplier which type of chat will compact and get solid after water is applied that's the one you want to use. Often flagstone walkways meander through the yard. Beautiful flower gardens on either side of the flagstone walkway add contrast to the rock texture. Sometimes the pieces are spread out with 2-3 inch gaps and ground cover or flowers are planted between the pieces. This makes for a very natural flagstone patio or path. This style is more like stepping stones though. 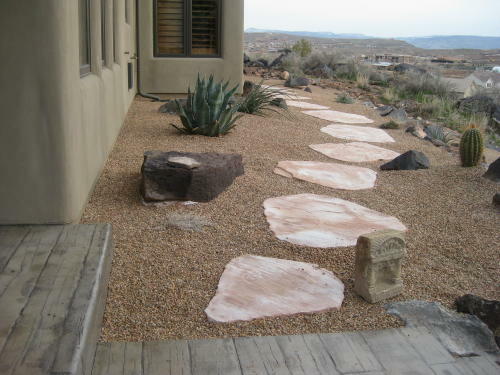 A flagstone path can also be more simple like this one. We took the full size pieces straight from the pallet and rounded the corners and rough edges. It's a simple path with gaps that are about 6" to one foot between the pieces. They are spaced perfect for walking on.